On my 84 Aspy, the odometer did not work. The trip odometer worked and the speedometer worked so I knew the sender on the front wheel was working. I had to check the odometer. Here is a step by step removal and testing procedure for the odometer and the Stepper Motor that operates it. It takes three to four hours or longer depending on motivation and number of wobbly pops involved, but I recommend taking your time. There are lots of parts and wires and a delicate circuit board. It is also a good idea to take notes, draw pictures, or take photographs especially if you are not going to get this all done in one day. Because I am limited to 25 images, the last part of this will be in a second thread. 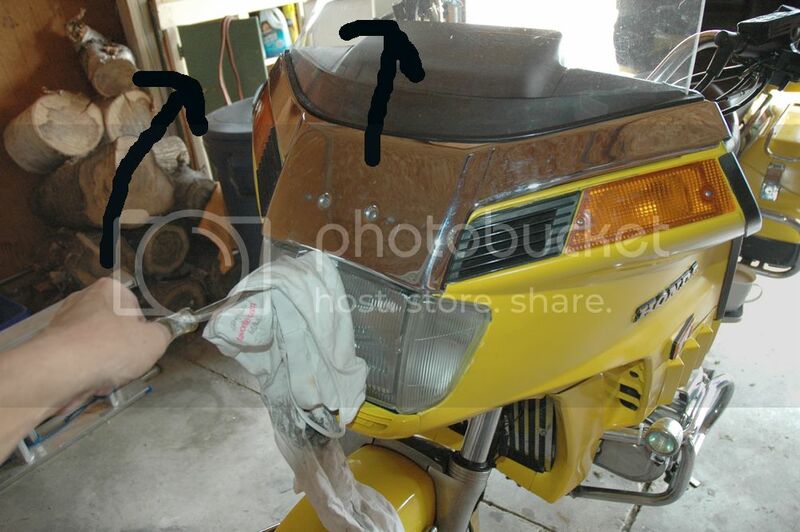 Remove the mirrors by peeling back the rubber boots and unscrewing the bolts. Remember which bolts go where. I have replaced my 84 mirrors with 85s so yours may look different but the bolts will be in the same place. 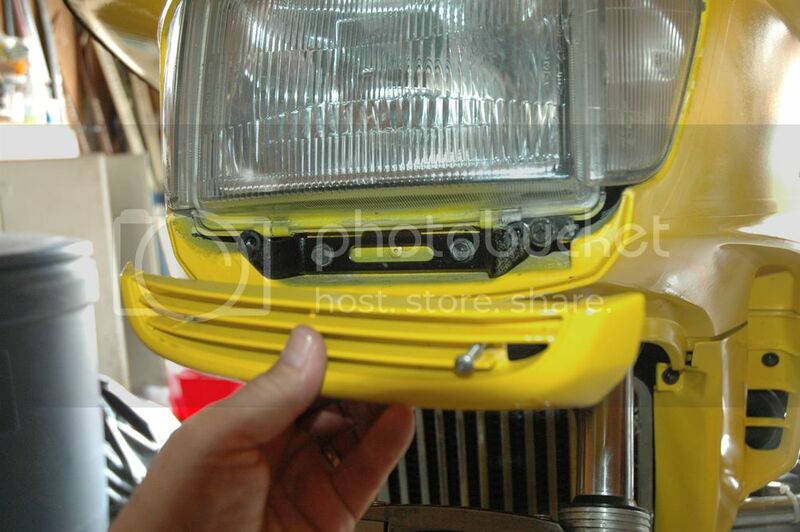 The front trim piece is removed by inserting a screwdriver between it and the headlight and lifting/prying. There is a rubber piece between it and the windscreen that sits on the top of it. 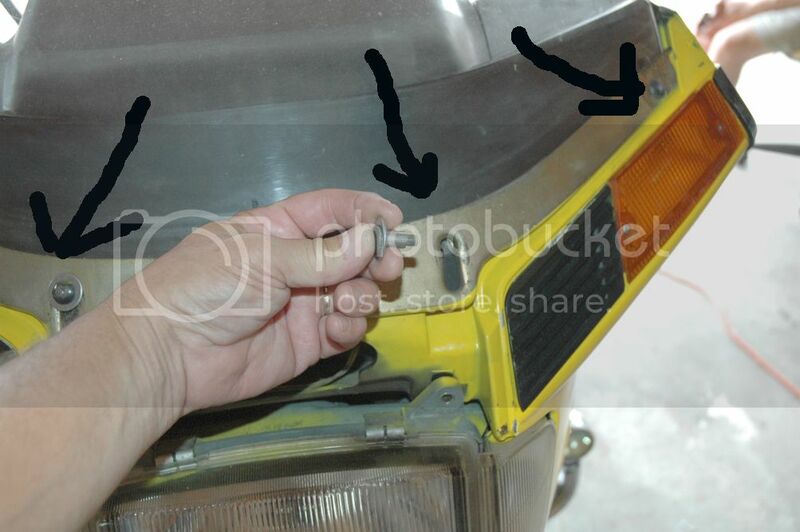 Remove the plastic trim piece below the headlight. 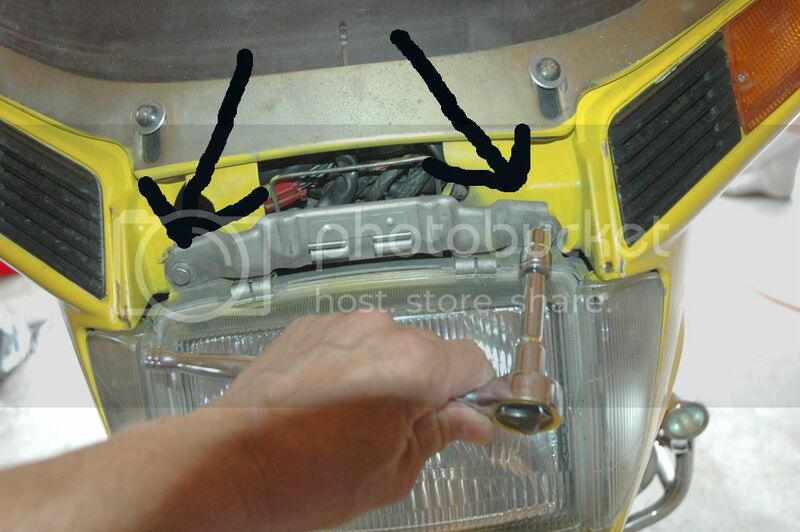 Remove the two 10 mm bolts holding the bottom headlight bracket in place. 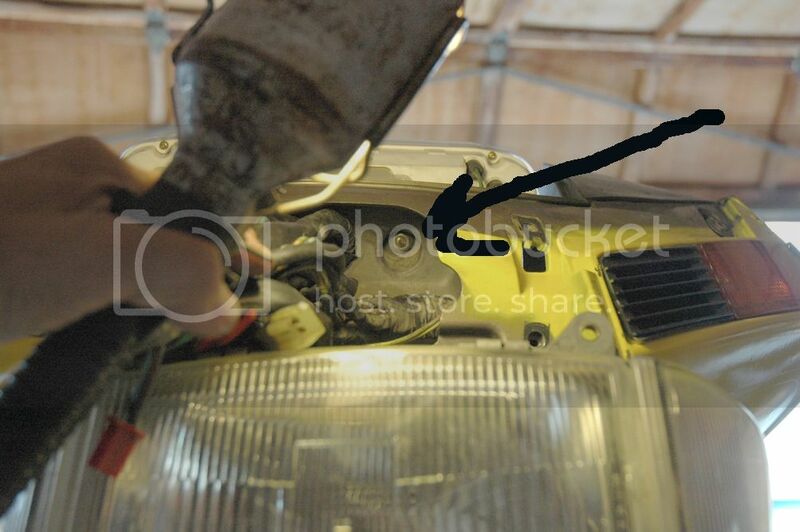 Remove the two 10 mm bolts holding the upper headlight bracket in place. The manuals all say to remove the headlight. I have found that you can leave it hanging and work around it. 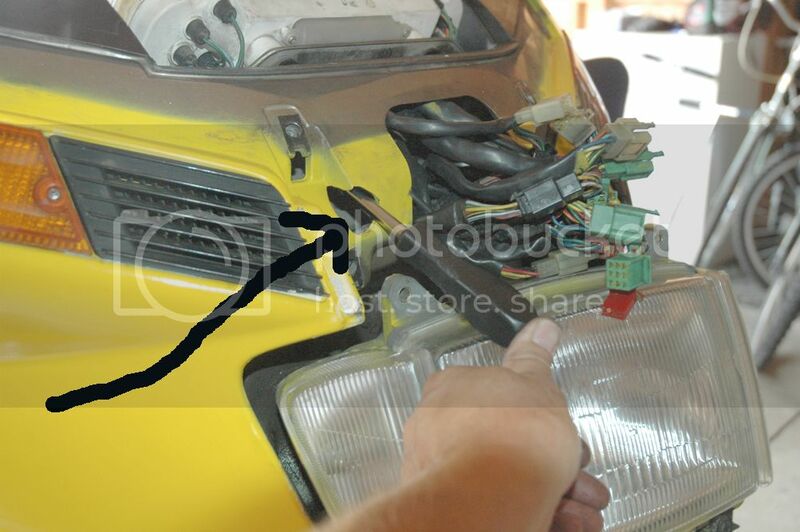 Remove the two middle bolts holding the windscreen. Only loosen the two outboard bolts. Lift the windscreen out along with the rubber gasket behind it. Make sure the two middle bolts have spacers on them as this keeps them from crushing the windscreen. They are still available if yours are missing. Google the part number from the parts manual. 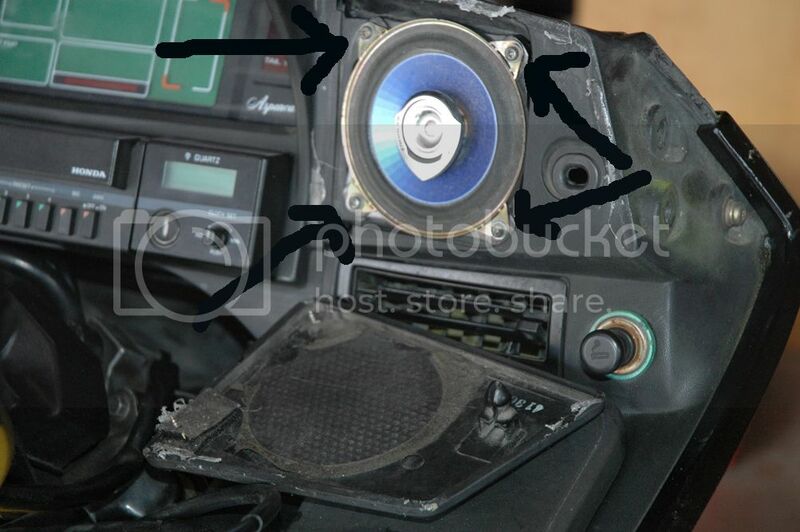 Remove the speaker panels. Mine are broken so they have screws in them. There is a rubber grommet behind the Honda label and two snap brackets on the upper and lower inside corners. Remove with care. Unplug the speaker wires – they are sized so they can not be mixed up. 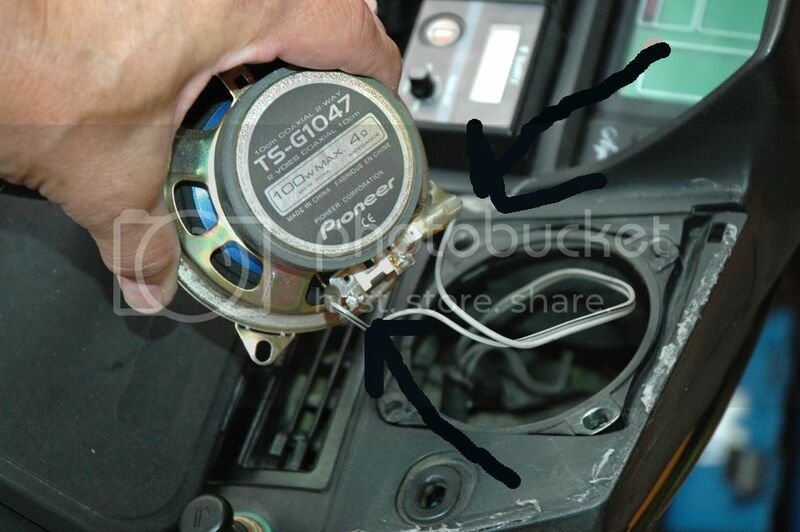 Pull the radio out by undoing the key lock. 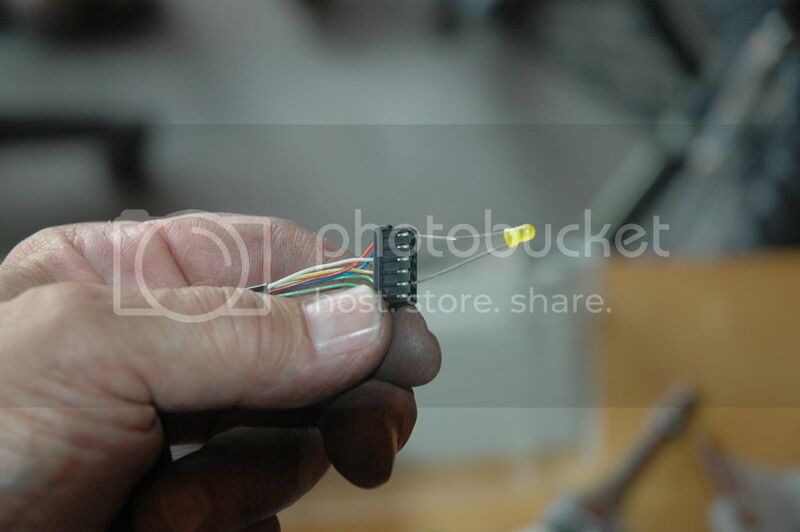 Disconnect the clock wiring harness. 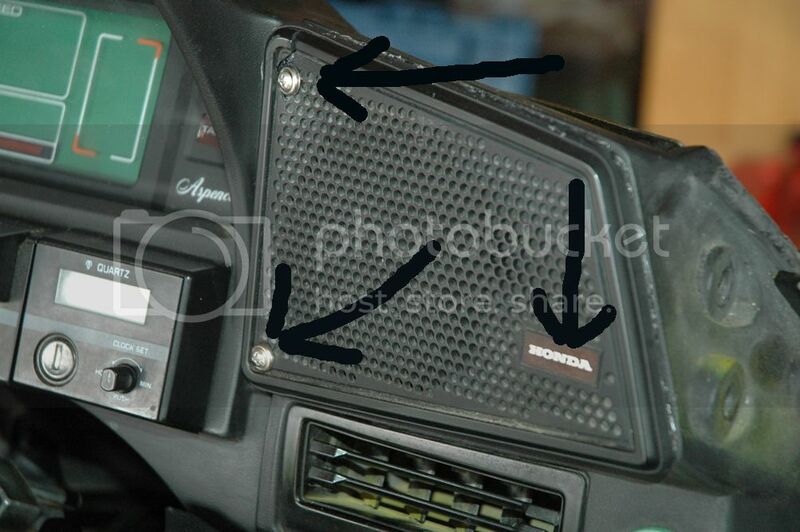 At this point you can check through the speaker holes and see if the outboard windscreen bolts can be removed so you can take off the metal windscreen holder. It is more convenient to work if it is removed. 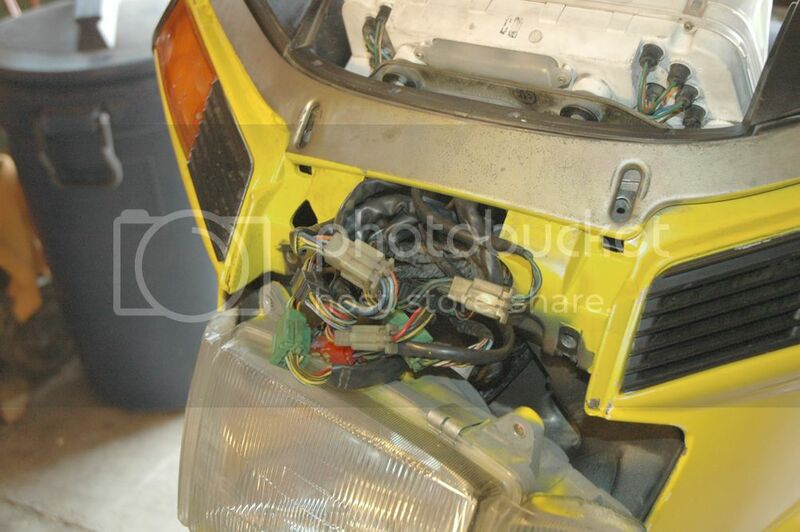 Look behind the headlight for the two lower instrument panel 10 mm nuts. 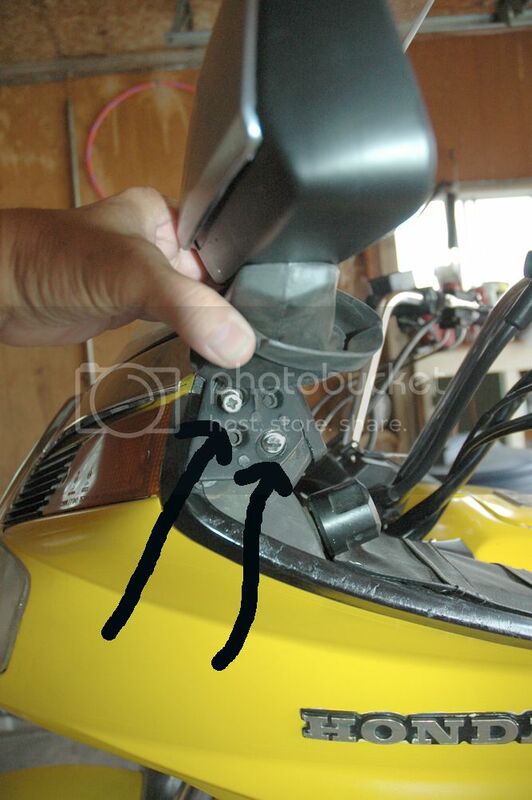 Do not get them confused with the two screws back here that hold the fairing to its frame. The left hand nut is easily removed. 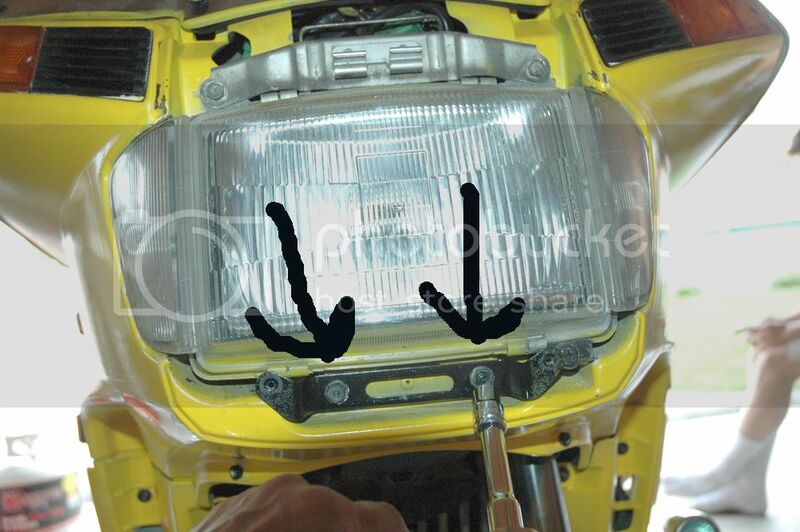 The right hand nut is easily removed with a small ratchet or flex driver by manipulating the headlight. 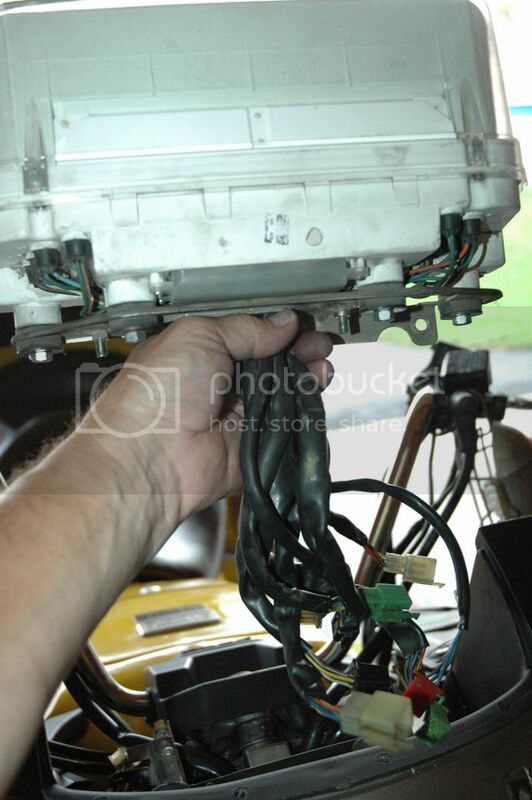 Pull all the instrument wiring harnesses out and unclip them all. If I remember correctly there are eight. They are all different colors and sizes so they can not be confused when you go to re-connect them so there is no need to identify them. Separate them so that the clips ends going to the panel are on top and the clip ends coming from the fairing are on the bottom. 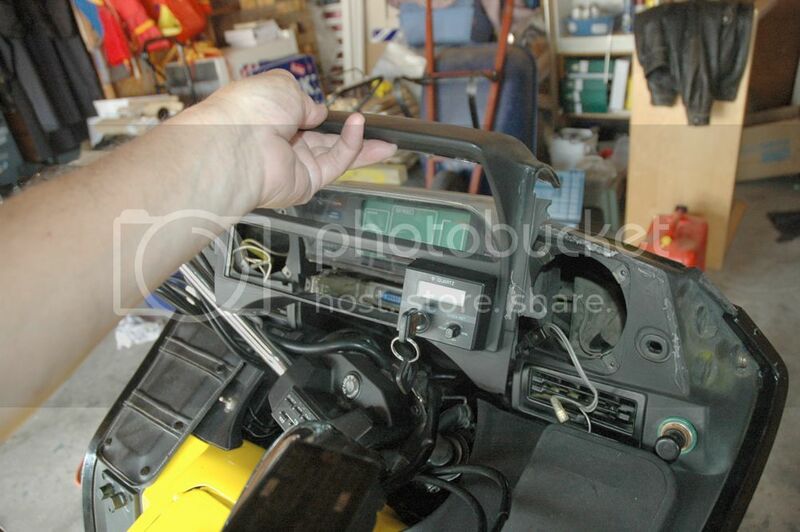 Locate the upper left hand nut holding the instrument panel and remove it. 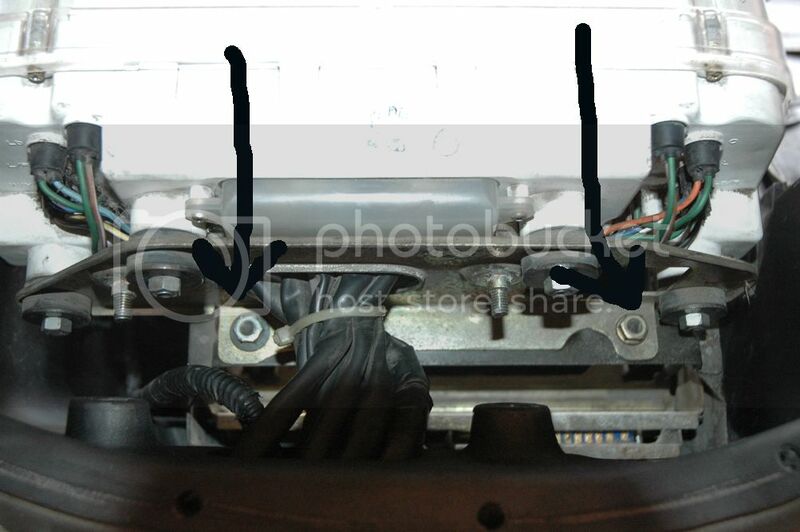 It is located behind and left of where the wiring harnesses were. 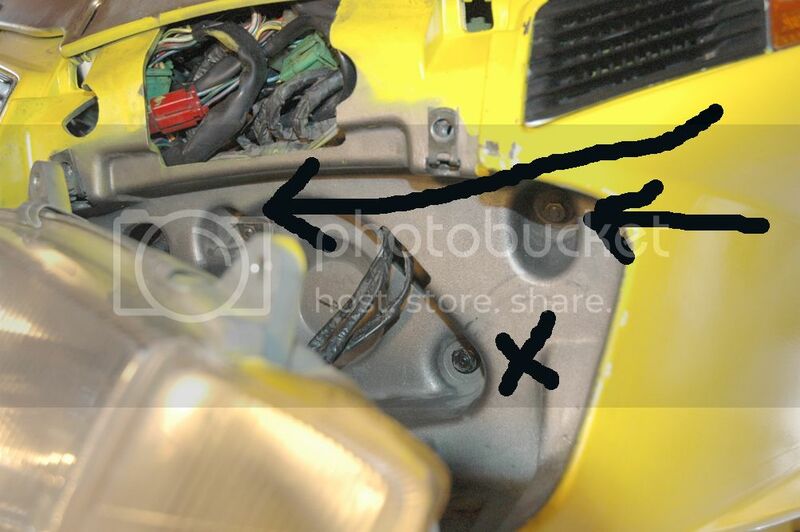 The upper right hand nut is almost impossible to see but with careful manipulation of the headlight and an extension on either a small ratchet or a driver, you can remove it through the access hole in the fairing. It is mostly a “by feel” thing to remove it and replace it. Now you can pull the instrument panel forward a few inches and disconnect the two 10 mm nuts holding the instrument panel to the radio bracket. 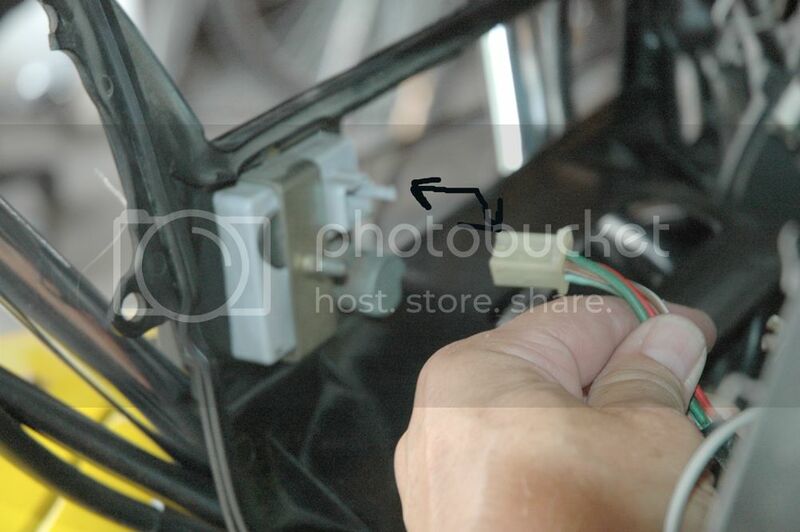 Carefully pull the wiring harnesses free of the access hole in the fairing. 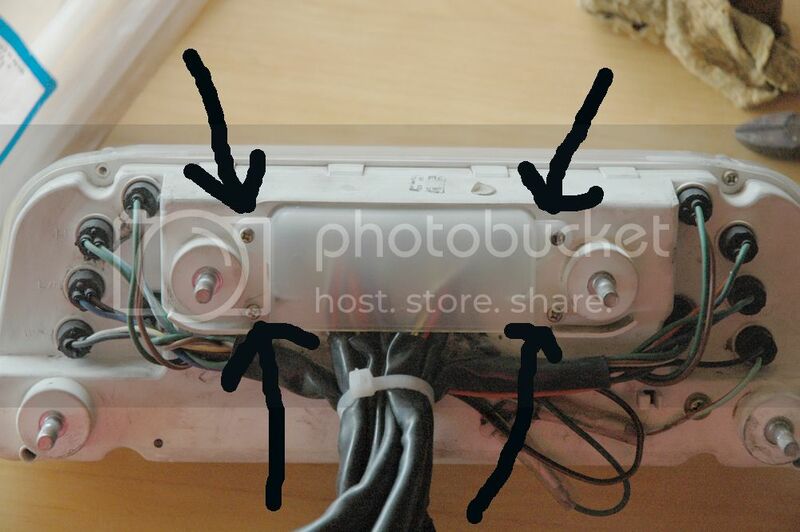 Place the panel face down and remove the four nuts holding the bracket. Remove the bracket. Locate the four screws holding the lens – two on top and two on the bottom - and remove them and then slide the lens off. 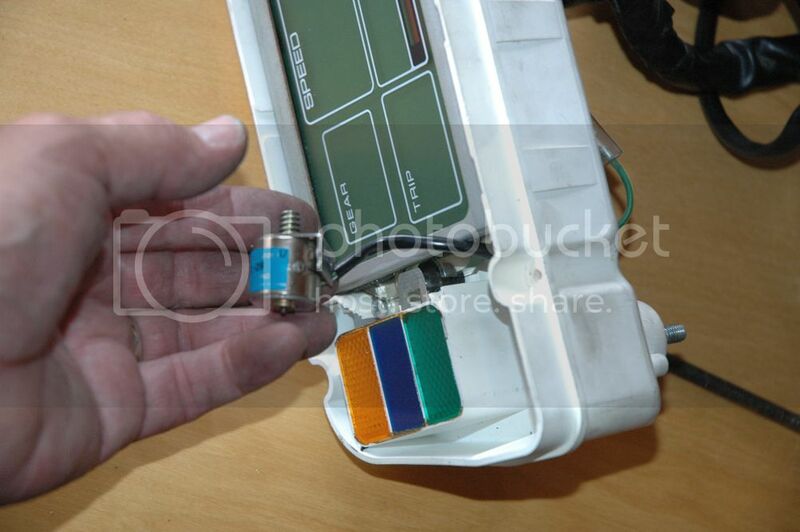 Locate the two screws holding the odometer and remove them. 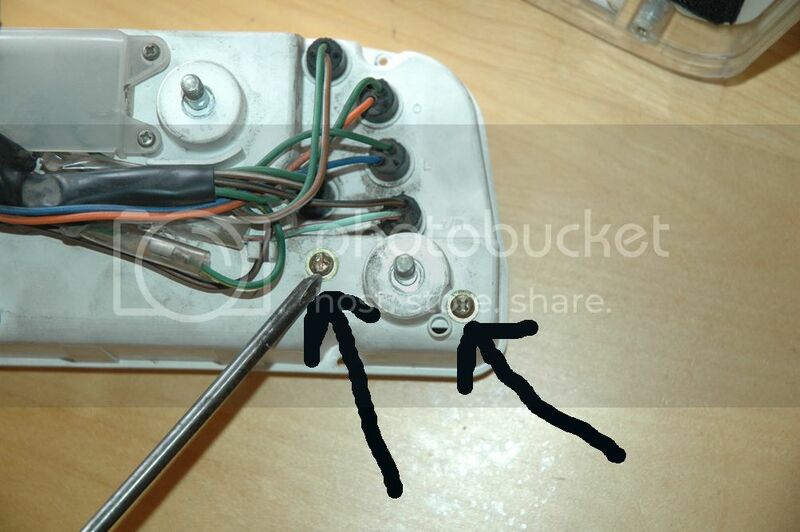 Locate the two screws holding the Stepper Motor in the odometer housing and remove them. Place the odometer aside for cleaning. You can test it by operating the long shaft gear with your finger. It only turns one way. Check for worn gear teeth where the Stepper Motor engages it. Clean it with electrical contact cleaner. 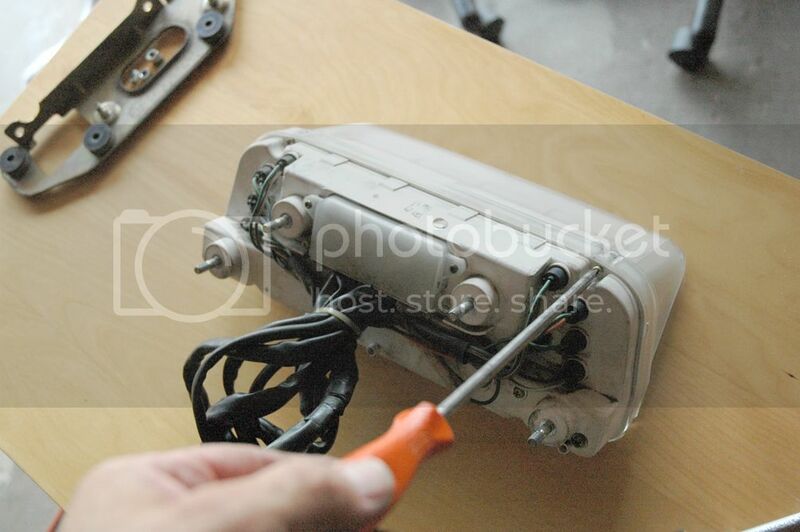 Remove the plastic cover on the wiring harnesses on the back of the panel and clip the wire tie. 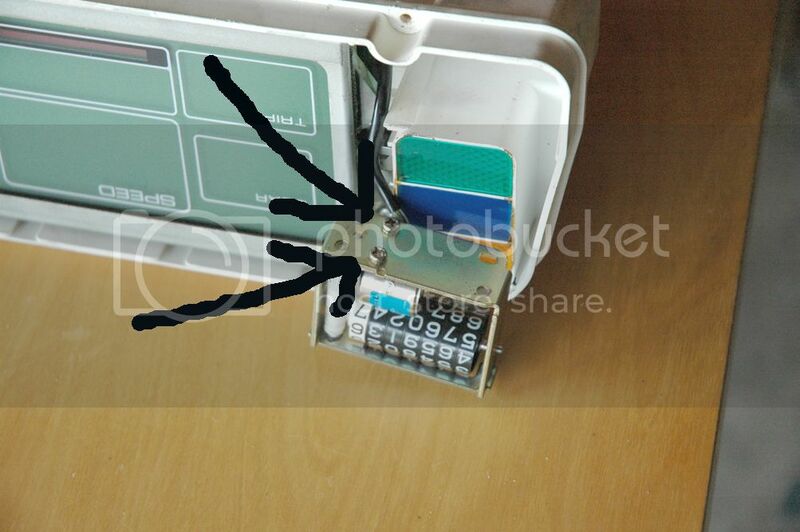 Remove the three screws on the front of the panel and then gently slide it partially out. 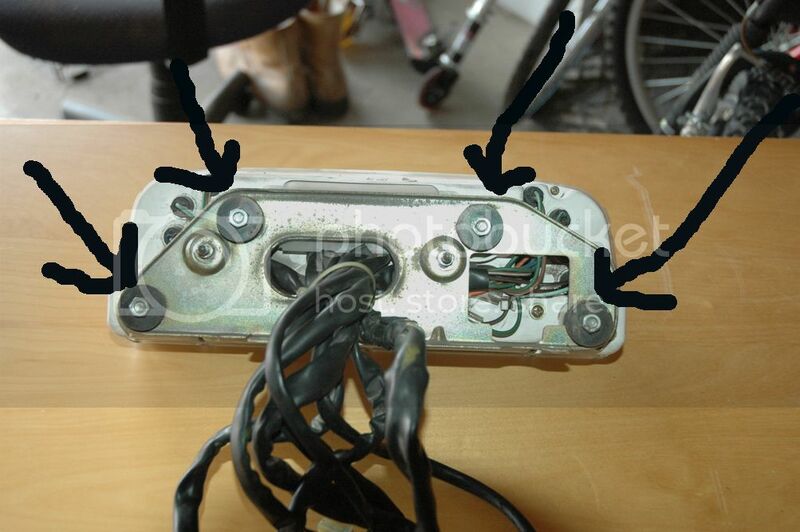 You will see the Stepper Motor clip and you can gently unclip this by pulling it. Remember its orientation for re-installation. You can test the Stepper Motor with an LED. On mine there are two grounds (green wires). Stuff one end of the LED wire in a ground and one by one place the other end in the other colored wire slots. If the circuits work you can spin the Stepper Motor shaft and the LED will blink. Test the two green wire slots with all the other colored wires. Some will work with each ground and some will not but they should all work with at least one of the green grounds. 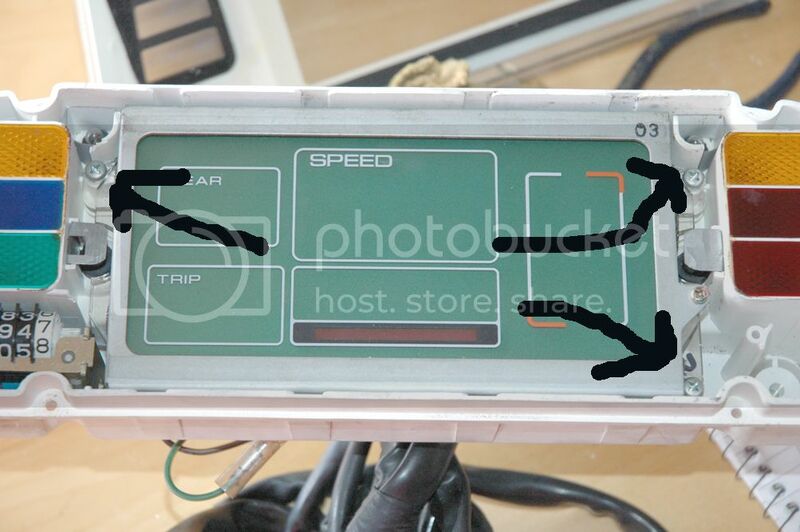 If this test shows the Stepper Motor is good then you have a connection problem or a circuit board problem or an odometer gear problem. 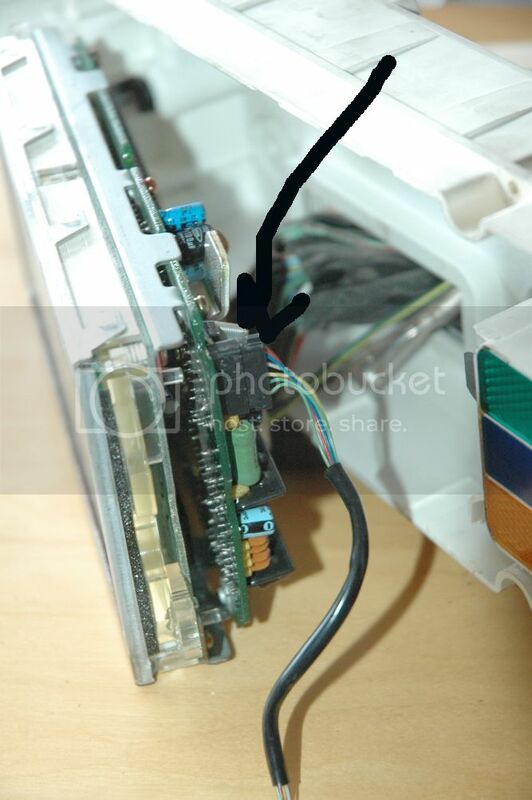 Spray electrical contact cleaner in the Stepper Motor connection on the motor lead where you tested with the LED, and on the board. If the Stepper Motor doesn’t work I don’t have any advice except happy hunting. Mine tested ok so I re-installed it. They apparently can be taken apart and cleaned but this looks like finicky work. You may also be able to find a replacement. Use the opportunity to clean the rest of the board and panel. 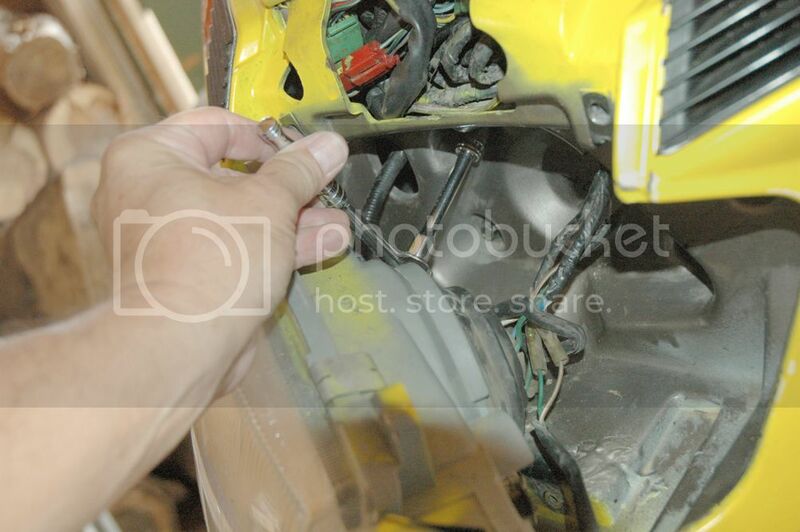 As they say in the manuals – putting it back together is a matter of reversing the steps. Pay attention to the way the Stepper Motor worm gear engages with the odometer plastic shaft gear. One test I suppose you could do that I didn’t think of before I put it all back together is to put the panel back together and then plug all the circuits back in. Jack the front of the bike off the ground and turn the key on. Spin the front wheel in the proper direction of forward travel for a while and see if the odometer changes. I don’t know if this will work but I don’t see why not. If you put this all back together and the odometer still doesn’t work it is likely a board problem - unless the plastic shaft gear is so worn in the odometer it just won’t turn. Time to search the bone yards. Or just keep track of the miles /kilometers with the trip odometer. What a fantastic job you have done here. I merged both threads because in just a few minutes they will be scattered all over the place with new posts changing the order of things. 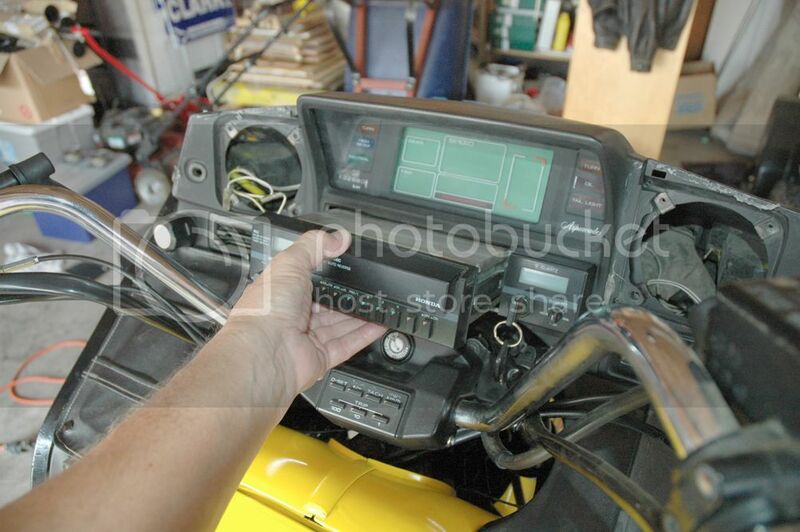 This thread is great for showing how to remove the instrument panel on the 1200.